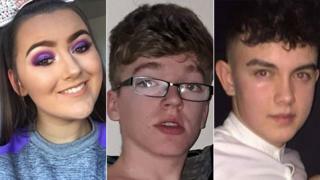 A decision on the entertainment licence of the hotel at which three teenagers died in a crush has been deferred by Mid Ulster Council until October. Morgan Barnard, 17, Lauren Bullock, 17, and Connor Currie, 16, died at the Greenvale Hotel in Cookstown. They were queuing to get into a St Patrick's Day disco on 17 March. At a meeting on Tuesday, the council's environment committee met to review the licence and asked the hotel to provide a health and safety risk assessment. It said in the interim period, the hotel has proposed to restrict its entertainment activity to weddings and private functions. "The hotel will provide the council with two months' notice of any proposed variation of this position," the council added. "The committee has, therefore, agreed to defer considerations until October when the licence is due for renewal. "The committee, however, reserves the right to review the entertainment licence at any stage prior to renewal." Two men, including the hotel owner Michael McElhatton, were arrested last month on suspicion of manslaughter. Both have since been released on bail.